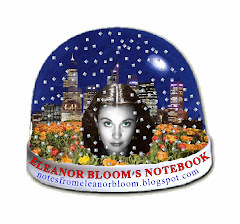 notes from eleanor bloom: Is that an echo I hear? Poor neglected blog. I do think of you often. Really I do. No! Don't turn your face away like that. Yes, you're sneezing from the dust and entangled in tendrils of webs, spiders perhaps even tickling some of your darker hidden nooks and corners... But, I do love you, really. It's just. I've been busy. Oh, you know I've still been at the computer a lot- you saw that did you? Well, yes, I've been writing other things. Don't pout! Honest, it's a wonder I've come back at all. Goodness me. I think I'd best just give you a moment to learn your manners again. Tsk. And to think, after all the hours I've given you, raising you post by post, and what thanks do I get!